MANILA, Philippines – Two months after Typhoon Yolanda (Haiyan), the Philippine government and aid organizations are transitioning from the emergency and relief phase to the recovery phase, and shelter remains the biggest challenge. The National Disaster Risk Reduction and Management Council (NDRRMC) has reported that more than1.1 million homes were damaged by Haiyan. Of that number, close to 600,000 were completely destroyed leaving many more families without a roof over their heads. With availability of construction materials being a challenge and the impetus to “build back better,” the International Committee of the Red Cross (ICRC) together with the Philippine Red Cross (PRC) are taking lessons learned from last year’s Typhoon Pablo (international name Bopha) and applying it to the reconstruction of homes in Samar and Eastern Samar. “Coming from the Bopha experience, we observed how homes in that area were commonly built. We saw a number of design and construction flaws that made the houses not very sturdy – like the foundation was not firmly anchored to the ground,” said Marco Albertini, Water and Habitat (WatHab) coordinator for the ICRC. “There were also a number of pieces (of the house) that were not interconnected so when the wind comes, parts of the house may be blown off in different directions,” he added. Fortunately, these were design flaws that could easily be addressed using mostly locally available materials, and with minimal impact on cost. “We found that just by modifying certain things in the basic design, we could make houses that are stronger and less vulnerable to the impact of the wind,” said Albertini. The Red Cross has developed guidelines for building “storm-resilient” homes as part of the rehabilitation effort in Pablo-affected areas. “We make a clear distinction between ‘typhoon resistant’ and ‘storm-resilient’,” emphasizes Albertini who explains that “storm-resilient” means building a home using reinforced foundation and interlinking parts and thus making it more resilient to harsh weather conditions. 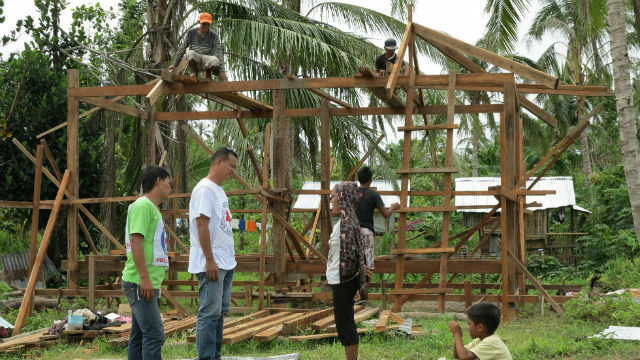 An estimated 2,426 families (12,130 people) in Cateel and Baganga municipalities in Davao Oriental and 700 families (3,500 people) from Montevista, Compostela Valley benefited from the construction and completion of 296 full houses and 2,830 skeleton houses using these “storm-resilient” principles. In addition, training on good construction practices helped more than 46,000 people repair their homes. 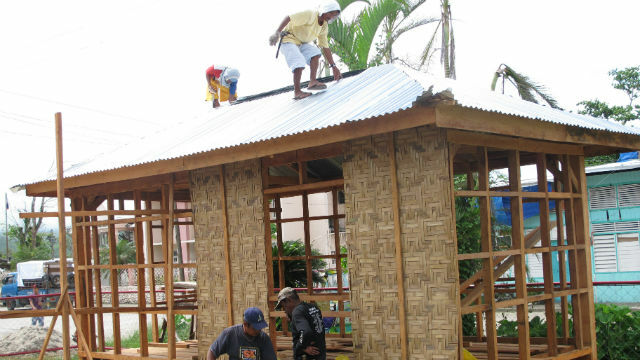 The ICRC and the PRC are targeting to build 6,000 storm-resilient homes in Samar and Eastern Samar province. Guiuan, where Yolanda first made landfall and where an estimated 90% of homes were destroyed, is part of Eastern Samar province. Albertini summarizes the basic principles of building shelter that is resilient to storms and other harsh weather conditions. 1) Solidly anchor the foundation deep into the ground. Ideally, the foundation of the house should be anchored at least 40cm (about 1 foot and 3.7 inches) into the ground. 2) Interlink all elements so the house is just one element. The elements of the house such as the roof, walls and floors should be interlinked or interconnected so the entire house is just one element. “A house that is one interlinked element and is strongly anchored to the ground is harder for the wind to move or blow apart,” explained Albertini. Verandas or overhangs (usually cooking or eating areas) should be avoided. This area is usually made of lightweight or improvised material and is attached, rather than linked, to the house. 3) Build a roof in such a way that it will be less prone to the impact of the wind. The less the roof is exposed to the direction of the wind, the less vulnerable it is to its force or impact. The general rule is that the slope of a roof should not be too high and a four-sided roof tightly strapped together is much stronger than the usual two- sided one. Where exactly a wind smart location is will depend on where the area is. For example, the direction of the wind will differ for coastal and mountain communities. Generally, the house should be high enough to allow for wind to circulate for ventilation but not too high that it will be exposed to the impact of the wind. Don’t build within an area of falling trees or coconut. Don’t build in areas prone to landslides. Destruction brought by Haiyan included the uprooting of coconut trees across thousands of hectares, destroying and disrupting livelihood streams across the area.The Eastern Visayas region, one of the hardest hit by Haiyan, is the second highest coconut producer in the country. In 2012, an estimated 46 million trees produced 1,771 thousand metric tons of coconuts. Initial reports from the Philippine Coconut Authority indicate that more than 33 million trees in the 7 provinces (Quezon, Guimaras, Iloilo, Negros Occidental, Cebu, Eastern Samar and Leyte) along the path of Yolanda were damaged in varying degrees; an estimated 15 million trees have been totally destroyed. Now, many of these trees are strewn across mountains and farmland. “All the fallen coconut trees need to be cleared away so the land they fell on can possibly be planted on again. Then they should be used,” said Albertini. The ICRC is exploring a debris-to-shelter strategy to make use of these coconut trees in shelter building. “Coco lumber is actually a soft kind of wood but it still can be made use of in constructing a house. As long as the 6 basic posts of the house are made of sturdy material like other hard wood like yakal, the rest of the house like the floors, for example, can be made using coco lumber,” he added. 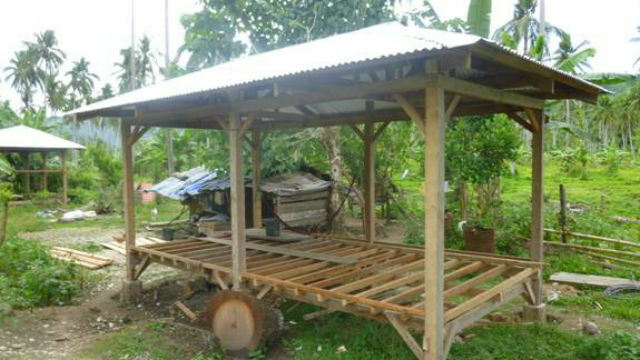 According to the 20 December situation report of the United Nations Office for the Coordination of Humanitarian Affairs (UN OCHA), the various humanitarian agencies are looking at “cross-cutting issues surrounding short- to medium-term shelter solutions” which includes the processing fallen coconut treesto be used for shelter lumber. The government recently announced its blueprint for rehabilitation called Reconstruction Assistance on Yolanda (RAY). The plan requires more than US$8 billion in investment over the next four years, with more than half going to shelter and the resettlement of people who were displaced. This entry was posted in Published Articles and tagged Disaster Recovery, Haiyan, Yolanda. Bookmark the permalink.